Milk is a nutritive beverage obtained from various animals and consumed by humans. Most milk is obtained from dairy cows, although milk from goats, water buffalo, and reindeer is also used in various parts of the world. In many industrialized countries, raw cow’s milk is processed before it is consumed. During processing the fat content of the milk is adjusted, various vitamins are added, and potentially harmful bacteria are killed. In addition to being consumed as a beverage, milk is also used to make butter, cream, yogurt, cheese, and a variety of other products. The use of milk as a beverage probably began with the domestication of animals. Goats and sheep were domesticated in the area now known as Iran and Afghanistan in about 9000 B.C. , and by about 7000 B.C. cattle were being herded in what is now Turkey and parts of Africa. The method for making cheese from milk was known to the ancient Greeks and Romans, and the use of milk and milk products spread throughout Europe in the following centuries. Cattle were first brought to the United States in the 1600s by some of the earliest colonists. Prior to the American Revolution most of the dairy products were consumed on the farm where they were produced. By about 1790, population centers such as Boston, New York, and Philadelphia had grown sufficiently to become an attractive market for larger-scale dairy operations. To meet the increased demand, farmers began importing breeds of cattle that were better suited for milk production. The first Holstein-Friesens were imported in 1795, the first Ayrshires in 1822, and the first Guernseys in 1830. With the development of the dairy industry in the United States, a variety of machines for processing milk were also developed. In 1856, Gail Borden patented a method for making condensed milk by heating it in a partial vacuum. Not only did his method remove much of the water so the milk could be stored in a smaller volume, but it also protected the milk from germs in the air. Borden opened a condensed milk plant and cannery in Wassaic, New York, in 1861. During the Civil War, his condensed milk was used by Union troops and its popularity spread. In 1863, Louis Pasteur of France developed a method of heating wine to kill the microorganisms that cause wine to turn into vinegar. Later, this method of killing harmful bacteria was adapted to a number of food products and became known as pasteurization. The first milk processing plant in the United States to install pasteurizing equipment was the Sheffield Farms Dairy in Bloomfield, New Jersey, which imported a German-made pasteurizer in 1891. Many dairy operators opposed pasteurization as an unnecessary expense, and it wasn’t until 1908 that Chicago became the first major city to require pasteurized milk. New York and Philadelphia followed in 1914, and by 1917 most major cities had enacted laws requiring that all milk be pasteurized. One of the first glass milk bottles was patented in 1884 by Dr. Henry Thatcher, after seeing a milkman making deliveries from an open bucket into which a child’s filthy rag doll had accidentally fallen. By 1889, his Thatcher’s Common Sense Milk Jar had become an industry standard. It was sealed with a waxed paper disc that was pressed into a groove inside the bottle’s neck. The milk bottle, and the regular morning arrival of the milkman, remained a part of American life until the 1950s, when waxed paper cartons of milk began appearing in markets. In 1990, the annual production of milk in the United States was about 148 billion lb (67.5 billion kg). This is equivalent to about 17.2 billion U.S. gallons (65.1 billion liters). About 37% of this was consumed as fluid milk and cream, about 32% was converted into various cheeses, about 17% was made into butter, and about 8% was used to make ice cream and other frozen desserts. The remainder was sold as dry milk, canned milk, and other milk products. There are many different types of milk. Some depend on the amount of milk fat present in the finished product. Others depend on the type of processing involved. Still others depend on the type of dairy cow that produced the milk. The federal Food and Drug Administration (FDA) establishes standards for different types of milk and milk products. Some states use these standards, while others have their own standards. Prior to 1998, the federal standards required that fluid milk sold as whole milk must have no less than 3.25% milk fat, low-fat milk must have 0.5-2.0% milk fat, and skim milk must have less than 0.5% milk fat. Starting in 1998, the FDA required that milk with 2% milk fat must be labeled as “reduced-fat” because it did not meet the new definition of low-fat products as having less than 3 grams of fat per serving. Milk with 1% milk fat could still be labeled as “low-fat” because it did meet the definition. As a comparison, light cream has no less than 18% milk fat, and heavy cream has no less than 36% milk fat. Other types of milk are based on the type of processing involved. Pasteurized milk has been heated to kill any potentially harmful bacteria. Homogenized milk has had the milk fat particles reduced in size and uniformly blended to prevent them from rising to the top in the form of cream. Vitaminfortified milks have various vitamins added. Most milk sold in markets in the United States is pasteurized, homogenized, and vitamin-fortified. Grade A milk refers to milk produced under sufficiently sanitary conditions to permit its use as fluid milk. About 90% of the milk produced in the United States is Grade A milk. Grade B milk is produced under conditions that make it acceptable only for manufactured products such as certain cheeses, where it undergoes further processing. Certified milk is produced under exceedingly high sanitary standards and is sold at a higher price than Grade A milk. Specialty milks include flavored milk, such as chocolate milk, which has had a flavoring syrup added. Other specialty milks include Golden Guernsey milk, which is produced by purebred Guernsey cows, and All-Jersey milk, which is produced by registered Jersey cows. Both command a premium price because of their higher milk fat content and creamier taste. Concentrated milk products have varying degrees of water removed from fluid milk. They include, in descending order of water content, evaporated milk, condensed milk, and dry milk. The average composition of cow’s milk is 87.2% water, 3.7% milk fat, 3.5% protein, 4.9% lactose, and 0.7% ash. This composition varies from cow to cow and breed to breed. For example, Jersey cows have an average of 85.6% water and 5.15% milk fat. These figures also vary by the season of the year, the animal feed content, and many other factors. Vitamin D concentrate may be added to milk in the amount of 400 international units (IU) per quart. Most low fat and skim milk also has 2,000 IU of Vitamin A added. 1 Dairy cows are milked twice a day using mechanical vacuum milking machines. The raw milk flows through stainless steel or glass pipes to a refrigerated bulk milk tank where it is cooled to about 40° F (4.4° C). 2 A refrigerated bulk tank truck makes collections from dairy farms in the area within a few hours. Before pumping the milk from each farm’s tank, the driver collects a sample and checks the flavor and temperature and records the volume. 3 At the milk processing plant, the milk in the truck is weighed and is pumped into refrigerated tanks in the plant through flexible stainless steel or plastic hoses. 4 The cold raw milk passes through either a clarifier or a separator, which spins the milk through a series of conical disks inside an enclosure. A clarifier removes debris, some bacteria, and any sediment that may be present in the raw milk. A separator performs the same task, but also separates the heavier milk fat from the lighter milk to produce both cream and skim milk. Some processing plants use a standardizer-clarifier, which regulates the amount of milk fat content in the milk by removing only the excess fat. The excess milk fat is drawn off and processed into cream or butter. A clarifier removes debris, some bacteria, and any sediment that may be present in the raw milk. The milk is then fortified and pasteurized. which automatically dispenses the correct amount of vitamin concentrate into the flow of milk. 6 The milk—either whole milk, skim milk, or standardized milk—is piped into a pasteurizer to kill any bacteria. There are several methods used to pasteurize milk. The most common is called the high-temperature, short-time (HTST) process in which the milk is heated as it flows through the pasteurizer continuously. Whole milk, skim milk, and standardized milk must be heated to 161° F (72° C) for 15 seconds. Other milk products have different time and temperature requirements. The hot milk passes through a long pipe whose length and diameter are sized so that it takes the liquid exactly 15 seconds to pass from one end to the other. A temperature sensor at the end of the pipe diverts the milk back to the inlet for reprocessing if the temperature has fallen below the required standard. 7 Most milk is homogenized to reduce the size of the remaining milk fat particles. This prevents the milk fat from separating and floating to the surface as cream. It also ensures that the milk fat will be evenly distributed through the milk. The hot milk from the pasteurizer is pressurized to 2,500-3,000 psi (17,200-20,700 kPa) by a multiple-cylinder piston pump and is forced through very small passages in an adjustable valve. The shearing effect of being forced through the tiny openings breaks down the fat particles into the proper size. 8 The milk is then quickly cooled to 40° F (4.4° C) to avoid harming its taste. The milk is pumped into coated paper cartons or plastic bottles and is sealed. The bottles or cartons are stamped with a “sell by” date to ensure that the retailers do not allow the milk to stay on their shelves longer than it can be safely stored. Milk cartons or bottles are placed in protective shipping containers and kept refrigerated. They are shipped to distribution warehouses in refrigerated trailers and then on to the individual markets, where they are kept in refrigerated display cases. To ensure sanitary conditions, the inner surfaces of the process equipment and piping system are cleaned once a day. Almost all the equipment and piping used in the processing plant and on the farm are made from stainless steel. Highly automated clean-in-place systems are incorporated into this equipment that allows solvents to be run through the system and then flushed clean. This is done at a time between the normal influx of milk from the farms. The federal Food and Drug Administration (FDA) publishes the Grade A Milk Ordinance which sets sanitation standards for milk production in most states and for all interstate milk shippers. The composition of milk and milk products is specified in Agricultural Handbook 52 published by the United States Department of Agriculture. It lists both federal and state standards. 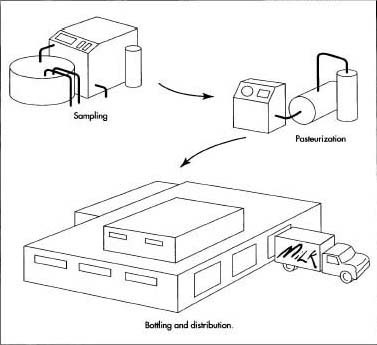 Testing of milk products includes tests for fat content, total solids, pasteurization efficiency, presence of antibiotics used to control cow disease, and many others. The trend to low-fat dairy products over the last 20 years is expected to continue in the future. Sales of butter are expected to decline, while sales of low-fat yogurt and low-or reduced-fat milk are expected to increase. Overall consumption of liquid milk is expected to increase as the population increases.